home to me right now (unrelated to the layout above) is my old red chair I picked up years ago at a garage sale. my intention was so reupholster it but never happened. it clashes with everything but I don't really care. it's comfortable, perfect for reading and surfing the net. 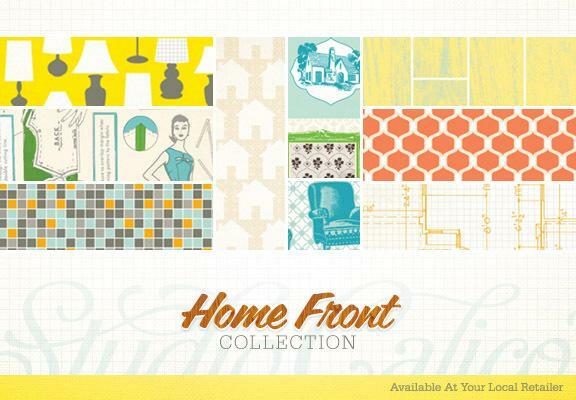 Studio Calico is sharing part of their home with you by sponsoring a giveaway of their brand new line, Home Front. Imagine June Cleaver styled 1950s domestic bliss. Featuring optimistic colors and smooth vintage inspired patterns. You’ll find fresh stained wood grain, retro home décor, an exclusive SC cardstock alpha set, and much more. Home Front is versatile, colorful, and beautiful (can we say that? )….I think you’ll love it. To win this collection, simply leave a comment on what home means to you and to increase your chances, visit the rest of the design team below. I will announce my winner on Wednesday morning.